The TANK-GUARD® Program is a corrosion protection and warranty service for aboveground fuel oil tanks up to 330 gallons capacity. It is offered through a select network of Oilheat Dealers in North America. The TANK-GUARD® Program is provided by Lincoln Laboratory, a company which has served the Oilheat Industry for almost 50 years. The useful life of an oil storage tank is impossible to predict, but the most common cause of oil tank failure is from internal corrosion which is caused by water condensation that collects on the tank bottom. Depending on where you live, oil tank replacement can cost from $1,000 to over $2,000. Your tank will be treated once a year (during a regular oil delivery) with TANK-GUARD® liquid corrosion inhibitor, which industry experts recommend to reduce corrosion damage inside your oil tank. If you have a tank leak which is covered by the TANK-GUARD® warranty, you will be eligible for either a cash reimbursement toward a replacement tank, or a free replacement tank installation. Most homeowner insurance does not cover oil tanks and most oil dealer service contracts exclude tanks as well. 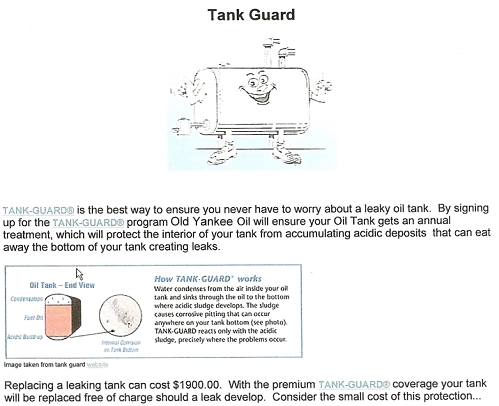 The best way to protect your oil tank is to sign up for the TANK-GUARD® Program. It will give you peace of mind for just pennies a day.